The Porsche 911 is the Holy Grail of sports cars. But Porsche has a problem from within: Their entry level car, the Boxster, has grown up. And it's good. Really good. If the 911 is King Hamlet, then the Boxster is Claudius, ready to usurp the throne at a moment's notice. In the 1990s, things weren't looking up for Porsche. Sales had dropped and the company couldn't just rely on the 911 any longer. The Boxster was Porsche's Hail Mary pass in the fourth quarter to succeed. It landed. The Boxster saved Porsche. By building a mid-engined car, Porsche made a substantial problem for itself. They built a car that is inherently better balanced than the big-daddy, rear-engined 911. If the Boxster was allowed to run wild, there is no doubt in my mind that it would be the best car in the Porsche lineup. But that sort of aggression would not stand within the Porsche hierarchy. The 911 has to be the best. The slowest 911 has to be faster than the fastest Boxster. These are the rules in Stuttgart and they MUSTN'T BE BROKEN. That's the foil of the Boxster. This is one of the best cars you can buy today. But you know that it could be even better and that's frustrating. The old Boxster had this doughy look, like a former athlete that had been sitting in his basement reliving those glory years. It ate one too many donuts. There was something bulbous and just kind of boring about the old Boxster, like Porsche didn't want you too look at it. The new Boxster has returned to the gym. It's chiseled, with stacked 918-esque headlights, short overhangs, detailed character lines, and a spoiler that is integrated into the lights. To my eye, it doesn't look as good as the 911 Carrera 4S I got to drive recently, but the same can't be said for the people I drove by. I sampled the car in Porsche's love/hate (I love) Lime Gold Metallic, and the sheer amount of thumbs up, "nice car," and approving looks shocked me. It didn't seem like I could go anywhere without a positive comment about the car. I agree, it looks the business, finally. If you've been in a modern Porsche, you've been in the Boxster. The nav screen, center console layout, and gauge cluster is either directly shared with other cars in the lineup or incredibly similar. Being in the Boxster is cozy, like a leather lined womb. Everything falls close at hand, whether it's the PDK lever or the nav controls. There is an exacting level of detail in here as any other car out of Stuttgart. It's what you'd expect out of a $90,000 roadster. Yes, $90,000. More on that later. The Boxster S has 315 horsepower and 266 pound feet of torque from its 3.4-liter flat six. Yes, that's less than the 911. Yes, it's slower than the 911. A 0 to 60 run is clocked off in 4.5 seconds when you have the PDK trans in Sport Plus, or 4.7 when you just want to dawdle. It never feels slow, and mid-gear acceleration is also adequate. I do find that the engine seems to get a little tired at higher revs, like it's almost struggling to will the car to accelerate more. It goes back to the Boxster not being allowed to be as good as the 911. The engine feels like it has been restricted so it can't beat its big brother. This car has the steel rotors. On my test car, they squeaked like mad all over the place to the point where it was almost embarrassing. This has not been my experience with any other Porsche, so I'll attribute it to the car having a hard life at the hands of journalists who flog the crap out of it all day long. The noise didn't impact braking performance. You have a solid pedal with immediate bite. This car hauls down from speed like you threw an anchor out the back. Performance is linear, and from high speeds there is no nervousness. Driving a Porsche is a treat every time, and huge part of that is the chassis tuning. In standard mode, the car is solid, but not back breakingly rock hard. It lets you know what's up. In Sport Plus, it is rock hard, but not "kid in 1998 Civic with wood in the springs to stiffen it up" hard. It's more like streetable track car or trackable street car hard. Sport Plus isn't an everyday setting, it's not really even an on road setting, but if you want the PDK to shift its fastest, that's what you need to have the car in. So here's what I do: Leave the car in normal, occasionally switch to Sport Plus, constantly smile. I said that the 911 is driven out of the back, and that's because the engine is way out there. The Boxster's engine moves forward, and so does the feel of the car. With an engine in the middle, this thing is mad planted in every single condition. From driving it on a track, I can tell you that it is neutral in all stages of the corner. I did briefly drive like a total moron, which overpowered the front end into a corner and pushed it wide. The first time I drove this car for a different publication, I said that the Boxster S was one of the best handling cars I've ever driven and I couldn't imagine Porsche could do better. At that point, I hadn't been behind the wheel of a 911. I've now spent a lot of time in 911s and I think that John P. Average will prefer the dynamics of the Boxster. It's an easier car to drive quickly. It doesn't have that 911 character of a pendulum over the rear wheels, which instills confidence and doesn't make you think you're going to crash. 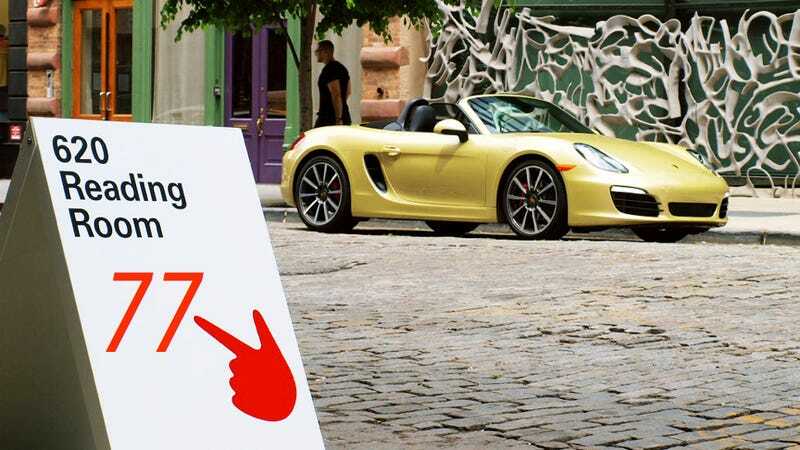 Think of the Boxster as "my first Porsche," a way to introduce people to the brand. At the limit, I don't think the Boxster is better than the 911, but I also don't think people will reach that limit on the road. And let's be honest, the majority of these cars will never see a track, even though it's very at home there. The Boxster is brilliant on the road. PDK is genius in paddles. I still maintain that this is the best transmission on the road. Shifts are impossibly fast and smooth in manual, raucous and nearly racecar sequential feeling in their delivery in Sport Plus, and in automatic it's imperceptible from a real automatic. I know, I know, the first 12 comments will be "but manual is more involving and better." We have to deal with what we're given. Like it or hate it, the manual transmission is going away and there is absolutely nothing that you'll be able to do about it. I'm sorry? That's why it's great that we're blessed with choices like PDK, which is still a visceral experience, it's just different than what you're used to. When the next thing comes along to replace double clutch, I guarantee we'll hear people saying "but double clutch is how you really experience driving." Change happens, and PDK is a change for the better. Let's roll with it, cause it's damn brilliant and exciting. You want toys? You got toys. Parking sensors. Nav. Satellite radio. Bose stereo. A brilliant transmission. Reconfigurable gauges. Sport chrono package. It has all you need in a small roadster. The audio experience on my test car wasn't awful, but I know that the Boxster can sound better. It had the Bose stereo, which is the B-Team to the top dog Burmester system. It still sounded good, but always seemed a little bass heavy, even after fiddling with all of the audio controls. It also didn't have the sport exhaust, which does emit a low pitched warble when the valves are open. Without it, you don't get pops and bangs on downshifts or that really great flat six hum. It still sounds good, but I know it can sound better stereo and exhaust wise. That's where the frustration lies. I sound like a broken record when I review Porsches in the value section, but how do they constantly come to us with $30,000 in options? Base price on the Boxster S is $60,900. This car was $90,535. And, like I said, it was missing the sport exhaust, the carbon brakes, the Burmester stereo. Road & Track just tested a Boxster S and a Jaguar F-Type V6S together. Their Boxster test car was $101,000. Think about that for a minute. $101,000 for the entry level Porsche. The Boxster is great, don't get me wrong. But it isn't $90,000 great. At $60,000, it's a steal. This one, with all of these options, is a $75,000 car in a $90,000 disguise. Then again, at $90,000, it's $50,000 less than the last 911 I drove. That has to count for something. But the real takeaway here is that the Boxster has finally come into its own. It hasn't usurped the 911 yet, but I imagine it's only a matter of time before this becomes the Porsche everyone wants to buy. The 2013 Boxster is seriously tremendous on the road and track.